Wrecking fools in Mad Max's wasteland is an absolute blast. You're alone in a vast desert Wasteland. Your car is broken, beaten, and busted, finally lapsing into an automotive coma. You have fuel, but what use is fuel with a non-functioning vehicle? You're doing your best to make repairs, but it feels like a lost cause and you're miles away from a valid outpost. Perhaps it's time to start walking. You take a step back from your faithful vehicle and in the distance, you see a car heading your way. Is this a good samaritan or an angel of death? As you make out the metal grill across the desert haze, you realize that the latter is more likely. As you turn to run, nearly 3 tons of razor sharp metal and monster machine send you flying into the air and your last thought is "Not a good samaritan." Sorry about that, dude. Places to be. I'm playing Mad Max by Avalanche Studios, the folks behind Just Cause 2, one of my favorite open-world games ever. Mad Max is not a game about being nice. Unlike Batman Arkham Knight or Shadow of Mordor, Max is not some heroic figure on a crusade against the worst his world has to offer. He's just a guy trying to survive. One with a solid skillset, a bit of post-traumatic stress disorder, and a badass V8 Interceptor. Wait, he lost the last one. Mad Max is not based directly on the films, meaning this is not a direct tie-in to the excellent Mad Max: Fury Road. 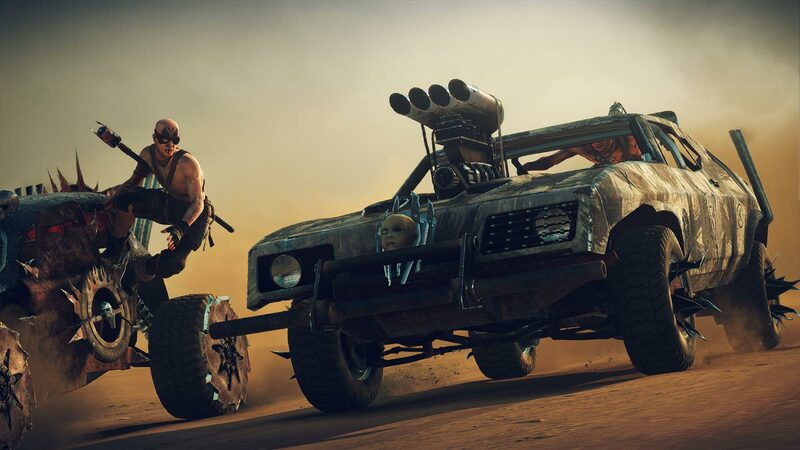 It was at one point intended to be a prequel to the film, but since then the crew at Avalanche has simply crafted an all-new tale inspired by Fury Road and its predecessors. A local warlord named Scabrous Scrotus (who looks oddly similiar to Fury Road's Rictus Erectus, while his crew looks like the War Boys) strips Max of his classic car and all of his supplies, leaving him alone in the desert to survive. After wandering the wasteland, he finds himself face-to-face with Chumbucket, a mechanic who decides to help the Road Warrior build a new car, the Magnum Opus. Max needs a mechanic, Chum needs a driver; it's a match made in the unforgiving desert. One-half of Mad Max is open-world survival. Max can take outposts on-foot in melee combat with counter-and-dodge melee combat that feels a bit heavier than its Batman Arkham-inspired origins. He can snipe guards from outpost towers or dispatch foes close up with his shotgun, but it's recommended to go light on the firearms, because ammo is scarce. He can scavenge for more ammo, more fuel, or scrap metal to upgrade his ride or his skills. Fuel is important because you can't just drive around the wasteland forever. I notice my fuel gauge creeping low in my demo and I turn to the developer who is walking me through things to ask what would happen if I ran out of fuel. "You'd be stuck there," he simply replies. Ice cold, Mad Max. Or, sand hot in this case. The Magnum Opus is the clear focus of your scavenging effort though. There's a deep amount of customization of the car, including color, body type, weapons, engine, armor, suspension, tires, rims, and even your hood ornament. You'll find new bits out in the wasteland at random, while others come from mission rewards. It all feeds back into the car and the question is: How do you want to ride? Do you want spiked rims like some automotive Ben-Hur? Tired of wasting ammo and time on random boarders? Install some jagged metal on your hood. If you're doing the cross-country thing, you probably want off-road tires, not slicks. What you put into your ride is informed by your playstyle. 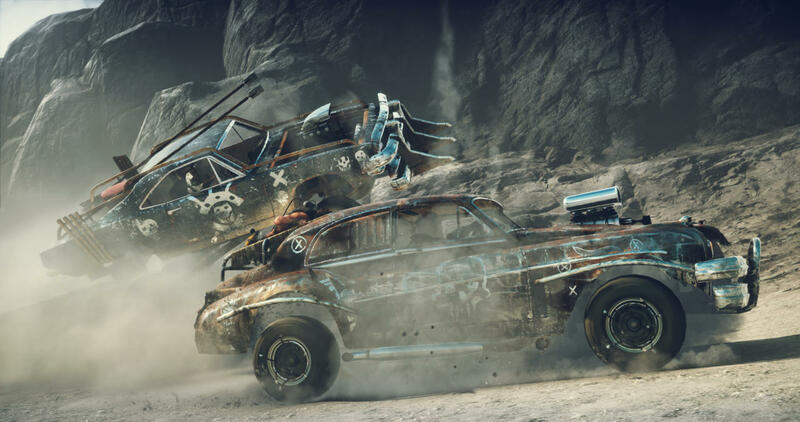 You'll be spending as much time in the Magnum Opus as you will playing Max, so the other half of Mad Max is car combat. As you ride the wasteland in your new charge, Scrotus' armies and other malcontents will try to stop you. It's up to you to stop them first, either by simply out-driving them or wrecking their vehicles. Mad Max's car combat is the Twisted Metal madness I've been missing. Riding around, slamming into other cars, using my side flamethrowers to light up fools, or outright ramming into those directly in my path; just the feel of driving the Opus is a ton of fun. That's before you even get to the Harpoon. If it's charged, activating your Harpoon slows down time for a bit, allowing you to aim for specific bits of an enemy vehicle. Once attached, you can then reel in the harpoon to pull those bits off. The harpoon is so damn satisfying. I'm having a blast attaching it to front tires and yanking them off, with cars flipping in the air from the loss. Heavier armored vehicles require you to harpoon off the armor before you can do sustained damage. Hell, I find out you can even harpoon drivers directly and pull them out of their rides. I can only imagine eager passengers' confusion when they realize their driver is gone and that rock outcropping is coming up really, really fast. Mad Max is not Mad Max: Fury Road. It'll never be Fury Road, which was a concise non-stop action movie with FURIOSA and GUITAR GUY! We're already down those two here. Mad Max is shaping up to be an open-world title with a focusing on destroying others and hoarding their stuff to make your car look cooler. 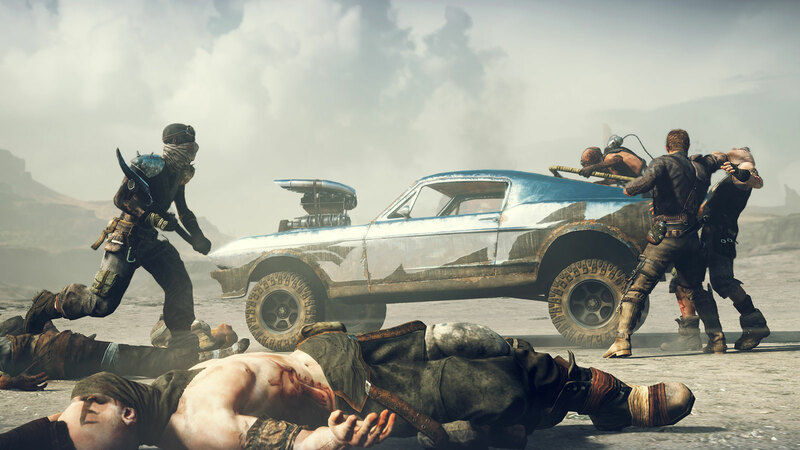 The car combat genre isn't busting to the brim with content, so Mad Max fills a hole while actually justifying its open-world mechanics with the narrative. All I know is I can't wait to get my hands on that harpoon again. Tagged with Avalanche Studios,	Previews,	Warner Bros Interactive Entertainment.